Not many executives can say they’re working in a field they’ve been passionate about since high school, but then they’re not Kecia Paredes. For Paredes, it’s natural to be proud of her Hispanic heritage. From high school to college to business school at Duke University, she’s always made an effort to stay connected to the Hispanic community. She joined Hispanic student organizations and even took leadership roles within them. It’s important to her that Hispanics have a seat at the table, that their voices are heard. “It’s a calling,” she said. That passion and calling have paid off. Today, she works at Geometry Global as the vice president of Hispanic shopper marketing for a top CPG company. 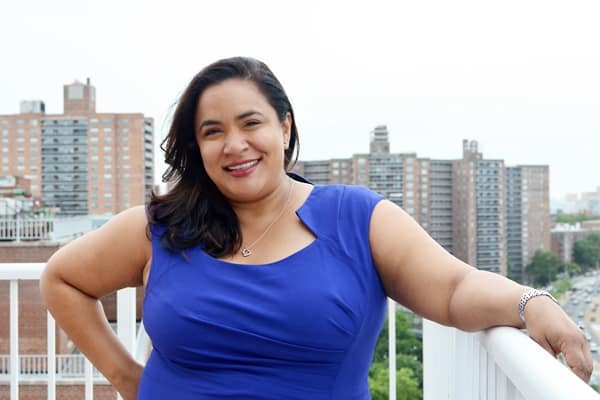 Her job is to make sure her client’s different brands know how to speak to Hispanic shoppers—and that they understand the diversity within Hispanic culture. She started the role in January 2017, after she was found on LinkedIn. The rest is history, and today she’s focused on making sure Hispanic shoppers are at the forefront for her client. In an interview with The Alumni Society, Paredes discussed how she partners with clients on Hispanic shoppers, what she especially loves about her job today, and her mega-passion for music. What do you enjoy about working at Geometry Global? Geometry registers as my first substantial glimpse into the agency side of brand management. I’d been on the client side prior to this for fourteen years, so it’s enlightening to see the magic behind the curtain occurring in front of my eyes. My colleagues at Geometry are absolutely amazing—beyond talented and creative. Whenever I’m in a brainstorm, I’m humbled and impressed by their quick thinking and the way they’re able to take a problem and find a solution for it creatively. It’s truly wonderful to witness. What do you especially enjoy about your role at Geometry Global today? I love helping people learn about the diversity that exists within Hispanic community. Sure, we may speak the same language, but connecting with us as consumers requires some nuance. To clarify, you have to be mindful of why something won’t resonate with, for example, the Cuban community or the South American community, and that’s something I excel at. What are you especially proud of since you’ve started with the company? We had a project that won an Shopper Marketing Effie Award this year. It was the first multicultural category win for my client, and it highlighted how once you take Hispanic insights at the core of what you’re trying to achieve, you can come up with a great platform and an award-winning program. An aha moment that has inspired the troops. What we’re building here is working and, with the right support, we can do so much more. Inclusive. The more thought leadership, the better, so I partner with our strategy team as well and making sure we’re effectively over-communicating with each other and so everybody knows what’s going on. We have frequent check-ins to ensure that everybody is empowered to be the voice of Hispanic so we’re not lost in the shuffle. Bootstrapper. I’m very resourceful. My mom, an immigrant from Ecuador, was a hairdresser who didn’t have the luxury of higher education. Often, I had to figure out stuff by myself. My friends would call me, “The Lifehacker.” If there’s a way to figure it out, I’ve figured it out. At the start of your career, what do you wish you’d have known? When I was making my way, I undervalued networking. I believed that your hard work alone should be enough to get you what you deserve. You have to, obviously, do a good job, but you also have to make sure to promote what you’ve done. After all, you’re your own best advocate. Also, there’s great value to securing paid internships. When I was a young adult, I opted for jobs that were in retail or tied to a good discount. What I hadn’t factored in then was that my retail jobs with the good discounts were preparing me with firsthand insights into the wonders of marketing and the retail environment. How do you cultivate your network? With my alma mater, Duke alumni, mostly. I volunteer, serve as a board member, attend events, and make sure to connect with students (prospective and/or current) and recent alums. Staying close to Duke’s alumni network makes networking easy. Forget six degrees; everybody’s 1-to-2 degrees separated from Duke. What are one or two experiences that have stuck with you throughout your career? Once upon a time, while interning for a top retailer, I had a work colleague ask me if I spoke Mexican. Looking back, I don’t think the intent was to offend. It did, however, provide an opportunity to connect with a colleague, and clear up their misgivings/confusion. So how did I do it? With humor, naturally. I said, “No, my mom is from Ecuador—where we speak Spanish.” I’ve found sharing that story to be educational on many levels for everyone. Also, working at Dannon was incredible experience. That’s where I flourished as a marketer. It was the first time I felt that feeling you get when you realize, Wow, I’m doing what I love. This is what I was meant to do. Music. I love music. I wake up to a radio alarm clock—an actual alarm clock, can you believe it? I keep multiple playlists that help me tackle the morning, afternoon, and evening. If I need to bang out a presentation, I have a playlist for that. If I’m in turbulence in the middle of a flight, I have a playlist for that, as well. Music is inspiring, meditational and helpful. It provides the soundtrack to this marketer’s life.